The city of Bremen is situated in north-western Germany, on the river Weser. The site of the medieval town has an oblong form, limited by the river on the south side and by the Stadtgraben, the water moat of the ancient defense system, on the north side. The town hall is situated in the center of the eastern part of the old city area, separating the market in the south from the Domshof, the cathedral square in the north. The statue of Roland is located in the center of the marketplace. The town hall is placed between two churches: the Dom (cathedral church of St Peter) is located on the east side and the Liebfrauenkirche (Church of Our Lady) on the west. Across the market is the Schütting, the seat of the ancient merchant guilds. On the east side of the market is the Modernist building for the municipal institutions, the Haus der Bürgerschaft, built in the 1960s. The World Heritage site consists of the town hall and the Roland statue; the buffer zone encloses the market and the cathedral square. The town hall has two parts: the Old Town Hall, on the north side of the marketplace, which was built in 1405-9, and renovated in 1595-1612, and the New Town Hall that was built in the early 20th century as an addition facing the cathedral square. 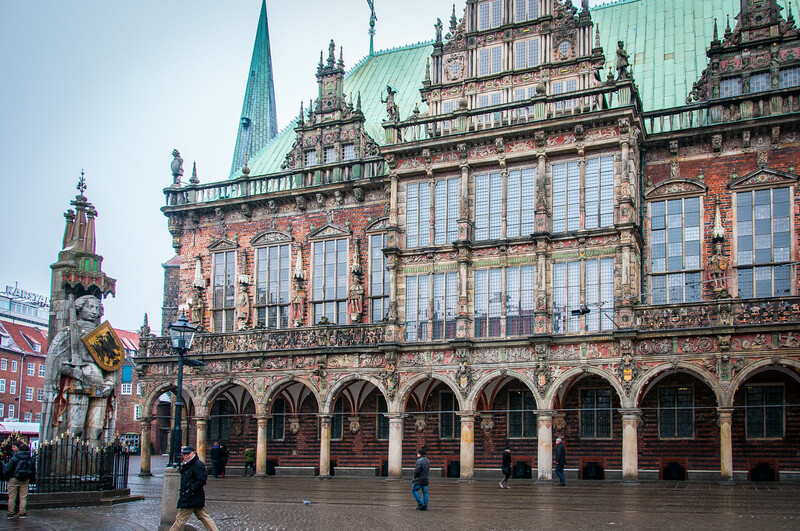 The town hall (Rathaus in German) of Bremen is a very interesting world heritage site. Through sheer luck, the building was untouched in WWII. It was expanded significantly in the 20th Century, so a large part of it is somewhat new. The old part of the building, however, is quite well preserved and is a great example of a medieval town hall. The facade of the building is fine enough, but in many respects, it is outshone by the merchants building across the square and it is dominated in size by the cathedral next door. The real treasure of the building can be found inside in the upstairs of the old part of the town hall. The main meeting area is a fantastic display of old German art, woodworking and Hanseatic symbols. Many of the large paintings date back hundreds of years and all tell a part of the story of the city. One of the paintings is entirely text and is a mixture of Old German, Flemish, and English. A sort of pidgin language used by Hanseatic traders in the region. The ground floor of the old building is a museum and the cellar is now a restaurant. The new town hall is still used as such by the city of Bremen. Part of this site, and it is included in its official name, is the statue of Roland in the front of the building. I knew very little of the story of Roland before I arrived, but you can find statues of Roland all over Europe. He became a symbol of independent cities of the Hanseatic League, which is why his statue is featured so prominently in Bremen. 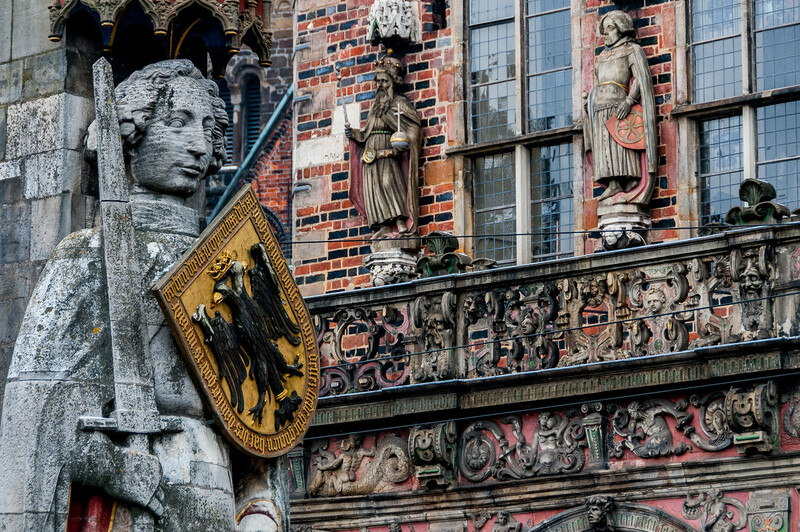 The Town Hall and Roland on the Marketplace of Bremen are a cultural UNESCO World Heritage Site in Germany. It was inscribed in 2004 for its urban landscape that is distinctively Medieval European in heritage. This UNESCO site represents the civic autonomy and market freedom that persisted in the city of Bremen during the Holy Roman Empire. The town hall and the Roland are both strategically and prominently located at the heart of the marketplace. 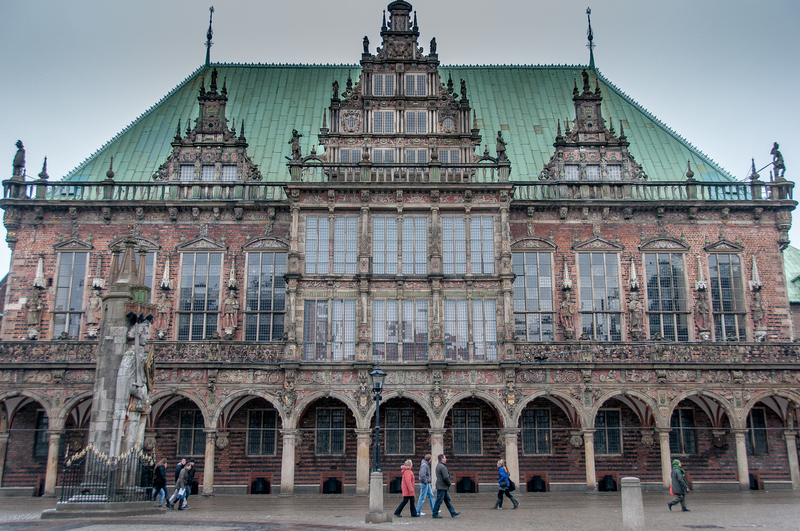 The city hall is the seat of the President of the Senate and Mayor for the City of Bremen, which is also part of the Hanseatic League. This city hall is considered as one of the best-preserved examples of European Gothic architecture. It is preserved via the monument protection act since 1973. The Town Hall and Roland on the Marketplace of Bremen consist of two iconic landmarks in the marketplace of Bremen. These two landmarks comprise this UNESCO protected site that aims to preserve the cultural heritage and history of this medieval European city. The town hall forms one half of the UNESCO site The Town Hall and Roland on the Marketplace of Bremen. It is located northeast of the market square within the historic center of the city. On the opposite end of the square, you will find Schutting, which is an ancient Guildhall. To this day, the town hall serves as the seat for the commerce board in the city. In the 1400s, the idea to build a Gothic town hall was proposed. When the town hall was built, it dominated the market square. It was also a showcase of municipal power in order to defy the archbishop. Indeed, the town hall was the prominent structure in the marketplace of Bremen and no longer the cathedral and archbishops’ palace. The Gothic style town hall is made up of 16 large sculptures. These sculptures depicted four ancient philosophers, along with emperors and prince-electors. The Bremen Roland is the other component of the UNESCO site The Town Hall and Roland on the Marketplace of Bremen. It is a statue of Roland that was erected in the early 1400s. It is located in the market square and directly facing the Town Hall (facing sideward to the church). This statue was built for Roland as he is seen as a protector of the city. In his statue, he carries a sword that is unsheathed. Meanwhile, he also carries a shield that depicts a two-headed Imperial eagle. The statue measures 5.5 meters high. This is not the only Roland statue in Germany, however. They are built in several German towns as they represent market rights and freedom. However, the Roland statue in Bremen is the oldest surviving of these statues.